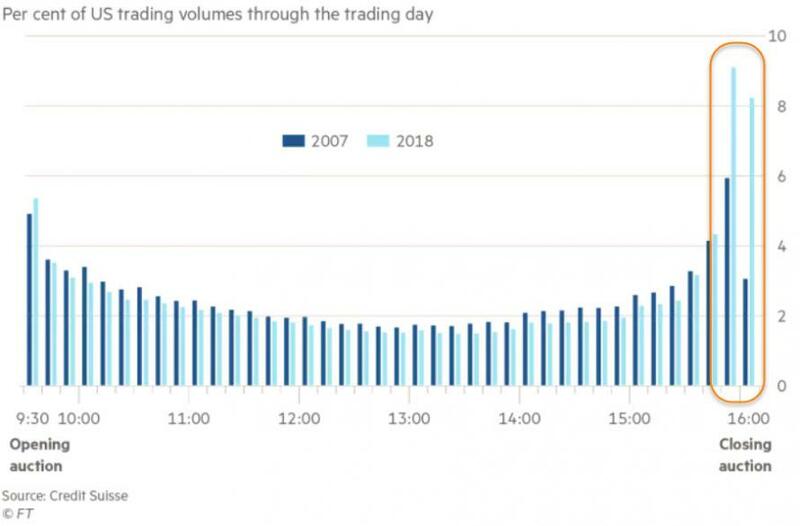 As The FT's Robin Wigglesworth reports, a seismic shift towards exchange traded funds and other index-tracking investment vehicles has heightened the importance of the last half-hour of the US trading day, from 3.30 to 4pm, when these passive funds typically conduct most of their activity to accurately match their benchmarks. That has prompted traditional active managers to conduct more of their trading during this window to benefit from greater market “liquidity”. 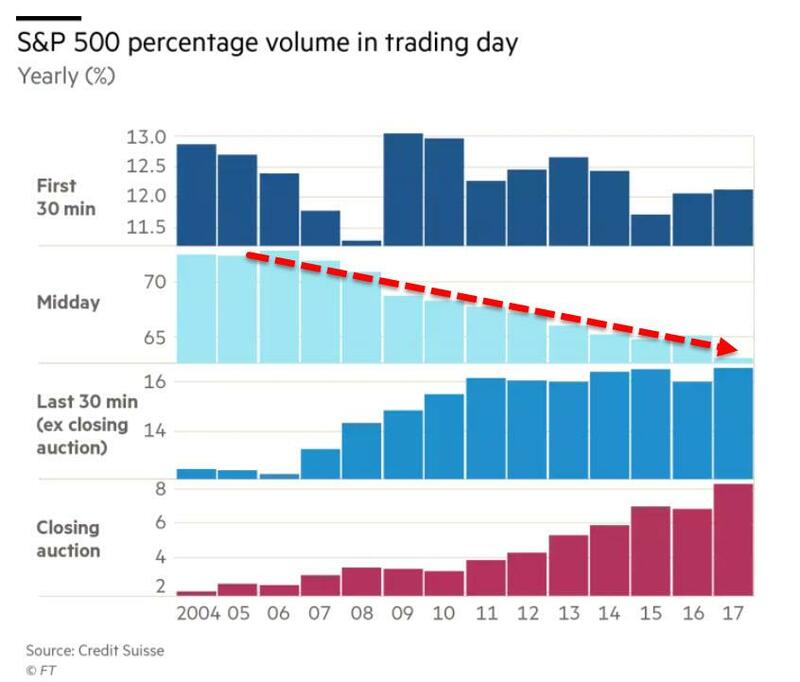 Some traders and investors complain that the funnelling of activity into the last half-hour of the day - which comprises nearly a quarter of all US stock trading - is sucking liquidity away from the middle of the day, when making large trades can now have a noticeable market impact. Indeed, what traders refer to as the “liquidity smile” formed by the pattern of trading volumes has recently become more pronounced and turned it into a “liquidity smirk” due to the lopsided importance of the 3.30-4pm trading window. Some now fret that, with so much money sloshing around in a small window, it increases the risks of market mishaps. “A lot of trading is concentrated in a very narrow period of time,” said Marco Pirondini, head of US equities at Amundi Pioneer Asset Management. And as Wigglesworth notes, given the clear trajectory of the trend, more midday volatility could start to become more apparent in the coming years. “It’s become a self-fulfilling prophecy. The liquidity feeds on itself,” said Todd Lopez, head of electronic trading for the Americas at UBS. A decade ago about 16 per cent of all trading happened in the final 30 minutes, but that rose to more than 20 per cent in 2012, and almost 25 per cent this year. The closing auction alone - when most ETFs do their rebalancing - now accounts for 8.2 per cent of volumes in 2018, up from 3 per cent in 2007. “It does come with increased operational risk,” Mr Lopez said. 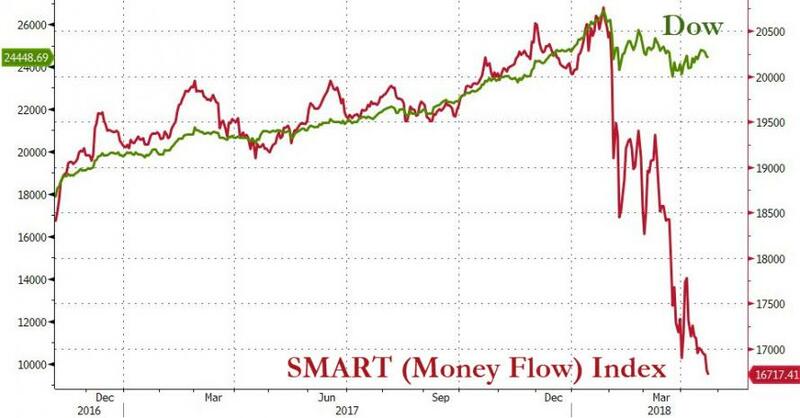 The last time there was a divergence between the so-called SMART Index (Bloomberg's index that measures the last 30 minutes flow relative to the day) was in early 2008 and then more drastically in October 2008... and that did not end well.